An Invitation to write a review. 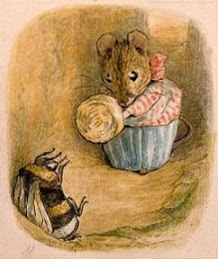 If you are visiting this blog then you are, in all likelihood, a lover of children's literature. If you enjoy reading children's books and have something to say about the books you read, I would be delighted to hear from you. Through the Looking Glass Book Review and this blog invites you to become a guest reviewer. Take a look at the reviews that we have already written on the Through the Looking Glass Book Review website to see what we are looking for and then put pen to paper - or fingers to keyboard - and write a review on a children's book that you have read recently and that you like. If we like what you send then we will publish your review on the website and on this blog. Please include you name, address, email, and website information (if any) with your review so we can give you credit for your work. Later in the year we will be holding a competition for newbie reviewers. Keep checking this blog for more information. There can't be many people who have not heard of that famous bear who is from "Darkest Peru." He adores marmalade and is a loyal and loving friend. He also has the most amazing penchant for getting into trouble - through no fault of his own. His adventures usually start with some everyday sort of event. For example in "More about Paddington" Paddington decides that he is going to help to redecorate his room. Unfortunately Paddington hasn't a clue how to hang wallpaper or paint. As a result he creates an awful mess and - just to make things more difficult for everyone - he papers over the only door leading out of his room. Only Paddington would do something like this. Though I read my first Paddington book a long time ago, I still chuckle over the pickles he gets into. I am delighted that Michael Bond is still writing books about this most splendid bear and I always look forward to reading a new book. If you are fond of this wonderful character then you might like to visit Paddington's Website on the Internet. 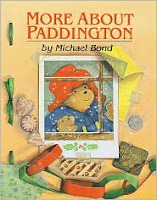 You will find my reviews for some of the Paddington books on the Through the Looking Glass Book Review Paddington page. Happy birthday Paddington and many thanks for all the laughs you have given us. Do tell us what your favorite Paddington story is, or if you have a special Paddington moment that you remember with fondness, tell us about that. Tasha Tudor, the much loved children's book writer and illustrator, died on Wednesday at her home in Vermont at the age of ninety-two. A prolific illustrator for many years, Tudor's art has charmed several generations of children and their families. Two of her books won Newbery Honor awards, and her title Corgiville Fair has become a firm favorite with many children all over the world. In this book Corgi dogs and other animals are the main characters, and they have a number of delightful adventures which are reminiscent of a bygone era. Tudor herself choose to live the simple life on her farm making her own bread, knitting, weaving, and caring for her beautiful garden. Tasha Tudor's lovely books and her indomitable spirit will be missed greatly. Do visit the Tasha Tudor and Family website to find out more about this extraordinary woman. There are two contests which both end on August 31st which young people - and the adults in their lives - might be interested in. One is the Samsung Hope For Education contest. Contestants need to write a 100 world essay about "“How has technology educated you on helping the environment and how or why has it changed your behavior to be more environmentally friendly?” For more information about this contest visit the contest website. Winners will receive computers hardware and software and cash for their schools. The second contest is perfect for young people who fancy going into the movie business. Laurie Halse Anderson is inviting anyone under the age of twenty-one to create a book trailer for her books Speak and Twisted. You can find the relevant information on Laurie's blog. The winner will win a 8GB ipod Touch. There is also third contest which I only just found out about. Holly Black - of Spiderwick fame - is hosting a contest which ends on June 29th. Contestants have to create a lolcat on one of three subjects. Visit Holly's Blog for more information. Winners receive a signed DVD of the new (ish) Spiderwick film. If you have heard of a contest which my readers would like to know about please drop me a line and tell me about it. For many of us June is the first real month of summer. Schools are closed, pools are open, and vacations begin. We pull out our summer clothes and put away shoes in favor of flip-flops and sandals. This is also a time when many of us, especially children, do a lot of reading. Children go to the library and sign up for summer reading challenges. They go to the bookstore and spend a wonderful time figuring out what to read next. Just to get you in the summer mood Through the Looking Glass Book Review has a summer books feature. On this page you will find a list of book titles all of which explore summer days in some way or another. 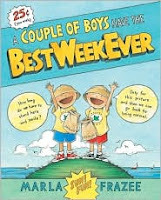 You will find that Eloise is going on a vacation, and there is the story of two little boys who go on a summer trip which is "the best week ever." You will find a book which explores the sounds of summer - Summer Beat - and in Mayfly you will go on a summer vacation with a family that spends wonderful days staying in a cottage by a lake. For readers who like something a little more fantastical there is Summer Story by Jill Barklem. In this book readers will get to see a summer wedding between two very charming little country mice. The illustrations in this book are wonderfully detailed and utterly delightful. I hope you enjoy this feature and do let me know if you have a favorite summer book. I just finished reading Mrs. Frisby and the Rats of Nimh by Robert C O'Brien - for the third or fourth time - and I was struck, once again, by how wonderful this title is. Every month Through the Looking Glass Book Review features one award winning title and I am having a terrific time reading my way through lists of Newbery winning and honor titles, Caldecott winning and honor titles, E.B. White winners, Kate Greenaway winners, Golden Kite winners, and more. You can see what I have reviewed so far on the TTLG Award Winning Titles page. You will, at the bottom of this page, also find links to the relevant pages on the Internet where you can find out more about these awards. Many of you may not know this but the daughter of Robert C. O'Brien wrote two additional books about the Rats of Nimh. I am in the process of reading these and will add my reviews to the Through the Looking Glass website soon. If you don't know which books to buy for the children in your life and don't have the time to look through lots of reviews, choose the award winning books. You can't really go wrong if you do, and you will be giving children some of the best children's literature there is. You will also be giving them such timeless characters as Dr. Dolittle, Charlotte, Ramona, Olivia, Little Bear, and many others. I was just reading about Hilary Knight, the wonderful illustrator who helped Kay Thompson bring her infamous Eloise to life. Mr. Knight is so talented and his illustrations of the precocious little girl who lives in the Plaza Hotel in New York City are unforgetable. I have always loved Eloise and reading about one of her creators was very interesting. 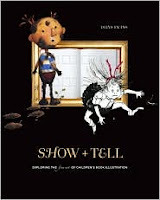 The book, Show and Tell: Exloring the fine art of children's book illustration, is beautifully written and it is really helping me to see children's book illustration in a new way. I highly recommend it. Not long after reading the chapter about Hilary Knight I came across a blog entry which interested me. The Blog is called The Children's Literature Book Club and the author has created a Children's Literature Alphabet. She has chosen her favorite children's book characters to create an alphabet. Among others Arthur, Eloise, Babar, Babymouse, and Madeline are in the listing. Take a look at the site and share your favorite children's book characters with others. 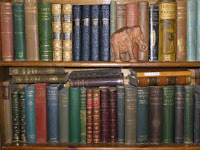 If you are visiting this blog you are, in all probability, a bibliophile. I am a confirmed book lover and have suffered from a case of too-many-books-not-enough-space my entire adult life. As a reviewer I have a new, additional, problem. Too-many-books-and-I-don't-know-which-books-I-have-no-matter-how-much-I-organize-everything. A few days ago I got a tool which book collectors of all kinds will love. I got a hand held scanner which can read ISBN numbers and a program which can sort and categorize book collections. All I have to do is to scan the ISBN number of a book and the program figures out what the book is (by checking online bookstores) and adds it to the database of my choice. This is a very valuable tool for someone like myself who receives several boxes and packages of books every day of the week except Sunday. I will no longer have to look through every book on the shelf to figure out if a requested book has arrived. If it is there I will know it because everything that comes in will be scanned into the new system. And, in time, everything that is here already will also end up in the system. With every blessed beep of my scanner my sense of knowing what is and what isn't grows. Who would have thought such a simple thing could give a person such peace of mind. Just in case you are interested, this is the website where I got my scanner and program. You can also use this program to keep track of your CD and DVD collections. Whoever invented this program, I thank you from the bottom of my much booked heart. I wanted to let you know that Lobster Press, a marvellous independent publisher based in Montreal, Canada, is hosting a contest. For those of you who have youngsters who like food and cooking this might be a perfect opportunity for you to share one of your favorite recipes with others. 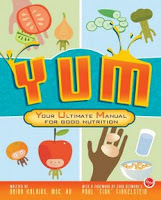 The winner of the contest will recieve Yum: You're Ultimate Manual for good nutrition and four other Lobster Press books. For more information visit the contest page on the Lobster Press website. A review of Yum will be appearing on the Through the Looking Glass website in due course. To continue with the animal theme I seem to have started here, there is another animal that I have a great deal of affection for - pigs. For eight years I had a wonderful pig in my life called Gracie. She was a potbelly who loved most kinds of food, tummy rubs, and company. She did not like cabbage, barking dogs, and strangers. Before my daughter was born Gracie lived in the house. In record time she learned how to open the fridge and she enjoyed stealing empty plastic containers which she played piggy soccer with. She liked to sit on the sofa with us and talked in soft grunts as she moved about the house Alas, Gracie had to move outdoors when it became clear that she might not be too enthusiastic to share her home with an infant. After my daughter was born Gracie lived in a luxurious insulated pig house and had the run of our Virgnia farm. When we moved to Oregon last September Gracie was found a new home. She just could not safely make the long journey from Virginia. It was hard to leave her behind and I still think of her every time I have a tasty morsel in the house which I know she would have liked. 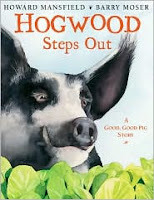 I was delighted therefore to come across a wonderful piggy book called Hogwood Steps Out: A Good, Good Pig Story. This is a book which really captures the intelligence and loveable nature of these wonderful animals. In the story Christopher Hogwood, a large and amiable pig, takes a walk on a spring morning. He leaves chaos in his wake as he munches and roots his way around the neighborhood. Thankfully the local humans are too fond of Christopher Hogwood to stay angry with him for long. This is definately a book which pig lovers of all ages will enjoy and appreciate. I suppose, considering the fact that I studied zoology, one should not be surprised that I love animals. I have quite a few living in my home, and I often go out of my way to make friends with animals that I meet. Just like with any other field of interest, there are certain areas of zoology that I like better than others. I find insects fascinating and think the relationships that sometimes develop between different species are fascinating. And, I have a great fondness for blue-footed boobies. Every since I first read about the Galapagos Islands, these funny looking birds have been steadfast favorites of mine. They have such a silly look about them and those blue feet are priceless. Then I saw a film of their little mating dance and that sold me on these birds. As you can see they lift up their big blue feet and wave them around. 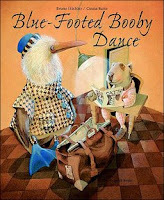 There is even a picture book about a blue-footed booby who builds a career for himself as a dancer. Blue-footed Booby Dance is a charming title and anyone who has dreamed of becoming a star will enjoy it. For those of you who can't resist tales peopled by magical, and often dark, creatures, the Mortal Instruments series is a must. For the June issue of Through the Looking Glass Book Review I reviewed the first book in the series, City of Bones. I have just finished reviewing the second book , City of Ashes. the review will be posted in the July issue of the journal. This second book continues the story of Clary, a teenage girl who discovers that she is a Shadowhunter, a human destined to rid the world of demons. Both her parents are Shadowhunters and to Clary's horror she discovers that her father is the kind of person you would really rather disown. Valentine was not a part of her life until recently and she dearly wishes he wasn't a part of it now. Alas, this is not to be. Valentine is here to stay and he is determined to make everyone's life miserable. Clary's life is complicated further when she discovers that the boy she rather fancies, Jace, is none other than her long lost brother. The problem is that one can't just switch one's heart into reverse when you make a discovery like this. Desperately Clary tries not to feel anything special for Jace, with very little success. The characters are amazingly credible considering the fact that so many of them are creatures you would not like to meet after night falls. Vampires, werewolves, and crafty faeries abound and blood and body parts splash the pages frequently. I am sure that this series is going to do very well and can't wait for the third book to come out.